Last weekend I promised you pictures of our progress. Maybe because this was our sixth consecutive weekend of work, or maybe because of the endless trim-painting, I found myself taking a "camera break" quite often this weekend. It's good. It's an excuse to put down the brush. Or the drill. Or the caulk-gun. This was Friday night. Patrick had a gig in Norwich. 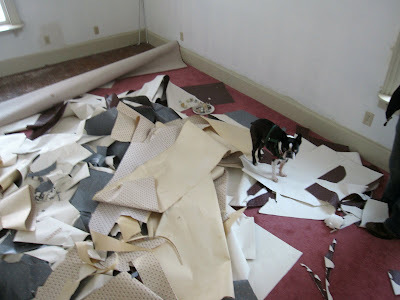 I debated going with him, but opted, in the end, to stay "home" and get my craft room floor ready for painting. I cranked Ani Difranco and howled along to Gravel, something I hadn't done in a long time. It's the kind of thing that's best when you're alone in the house, in the echo-y splendor of a carpet-less room. We took up the carpet in this room last weekend, and I was pleased to discover some lovely wideplank floors underneath. 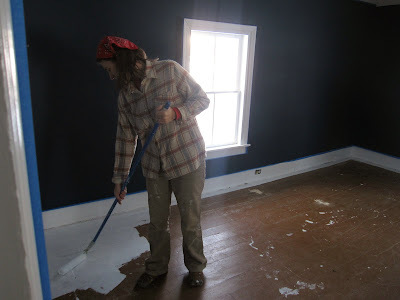 The plan is to paint the floors upstairs, and sand and refinish the floors downstairs. I borrowed this idea from SouleMama. She and her family closed on their hundred-and-fifty-plus-year-old farmhouse in September, and I've been quietly (and reverently) watching their progress, taking notes and finding inspiration along the way. 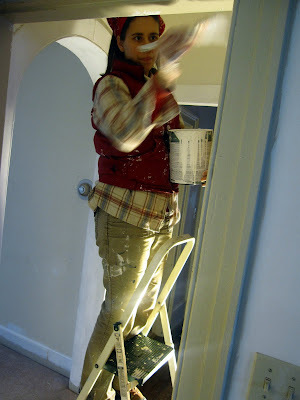 Then I painted the closet shelves. This closet is off the upstairs kitchen (from when the house was made into two apartments). The kitchen is going to become our laundry room, and I'm thinking this will make a perfect linen closet. I spent the balance of the evening propped up on the air mattress watching Season 6 of the Simpsons on our laptop. It was a good Friday night. I took some pictures to show you all, while Patrick and I padded around with our mugs of tea and breakfast sandwiches from the general store. 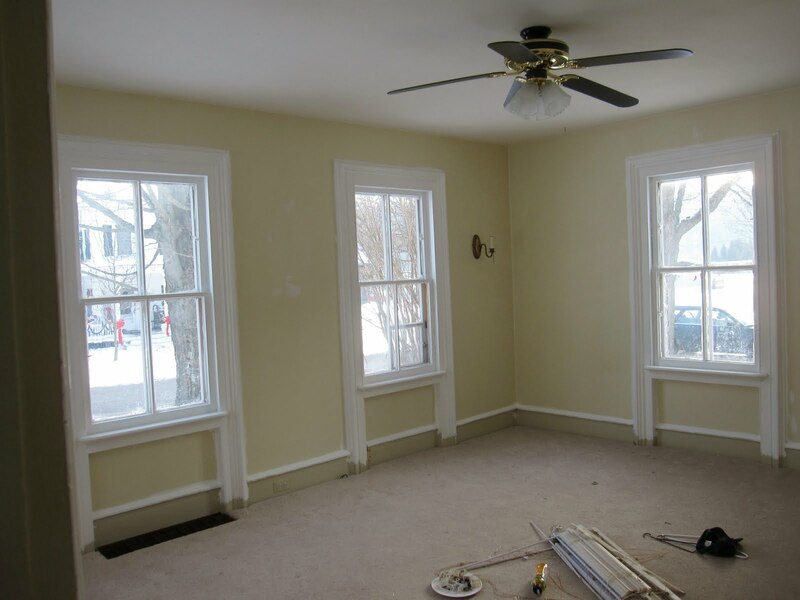 You can see before pictures from all of these rooms right here. Great Room. Formerly purple-wallpapered. 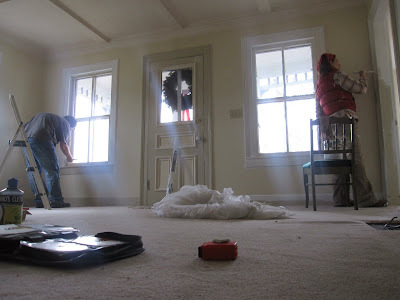 A mantle and some built-in bookshelves, as well as an ambitious decorative painting project are in the works for this. After we clear out the mess. Front room. This is going to be Patrick's music space. The trim, formerly greenish beige (EW!) was my main project last weekend. THREE COATS. Oh, the madness. Dining Room. We pulled the carpeting in here first. Check out those gorgeous floors. A little sand-and-refinish is all they'll take. And, oh yes, the sconces are GOING. This is where we stood Saturday morning. Do you like the color? It's intense, but I love it. 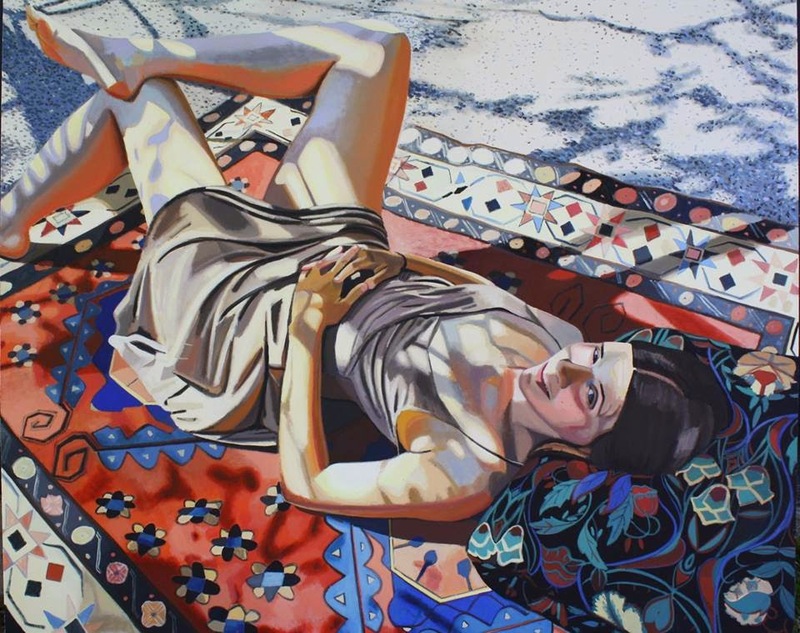 Playful and inspiring and passionate, just like the creating I'll be doing in this space. I sanded, vacuumed, and primed. I used a sander hooked up to a shop vac-- and I heartily recommend that. It's a lot more pleasant than crawling around on all fours in a cloud of lead paint dust. Ahhhhhh. It's taken us five weeks, but we finally have one room completely ready. 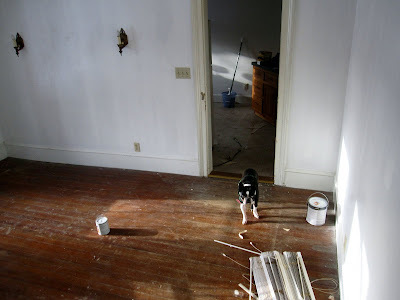 Floors, trim, ceiling, and walls. The trim took us three coats. The walls took three coats. 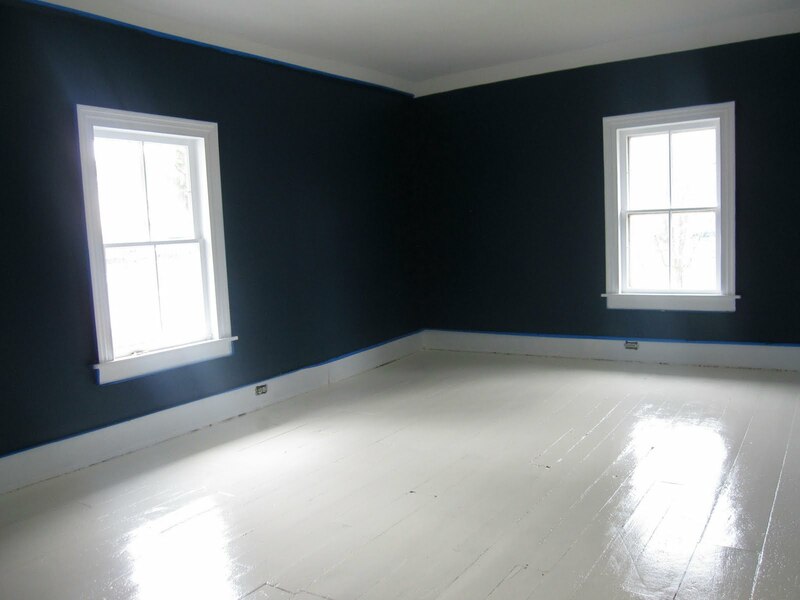 The floors took three coats. Miraculously, the ceiling only took one. So maybe you see, now, why it's taken us five weeks! We spent the rest of Sunday painting trim downstairs. Lord a-mighty, is there a LOT of trim. 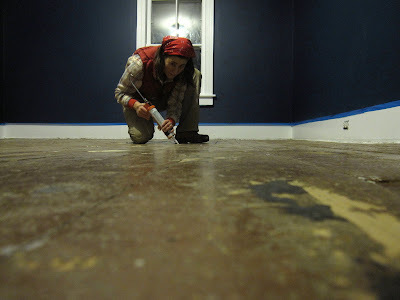 Once it got dark out, we rinsed our brushes and pulled up a carpet. 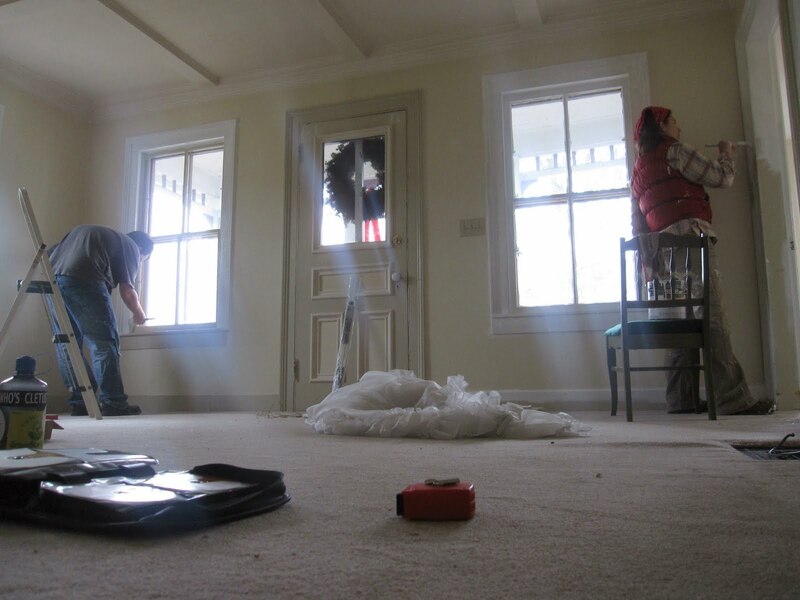 Pulling up carpet has become our instant-gratification morale-booster of choice. When we're both flopped dejectedly on the air mattress with Diesel on Sunday afternoon, groaning with aches and worn out from working, it's the only thing that will reliably rouse us. Our choice was the upstairs stairwell, which I unfortunately don't have a before picture of. This is the stairwell that got walled over when they converted the house to two units. We pulled up the carpet. Patrick crawled around drawing out hundreds of enormous screws with his drill, while I paced and smiled. Then we peeled back the tar paper. And there was a trap door. This is why we bought an old house. For treats and surprises like this, for the thrill of domestic archaeology. We pulled a few more screws, and then cre-a-a-a-k, up it came. It turned out to be covering and enclosing the top couple of steps, and underneath was all the banister and balustrades they'd torn out when they made the conversion. All in pretty decent shape, aside from a hearty dose of dust. I'll be honest. I would've preferred a time capsule, a box of old photos, or even a pile of random junk. A sheaf of old wallpaper. I'm the type to prefer romance and intrigue over practicality. But really, it's pretty cool to have the original woodwork. All this is part of the house, part of its story, and it'll be easily resurrected and re-installed. Not to mention, a big money-saver, too! 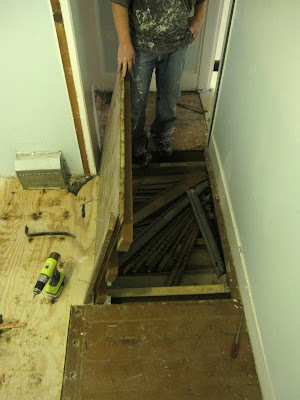 Next weekend, we'll finish re-opening the stairwell, and boy am I looking forward to that. Anything for a break from trim-painting! I have no idea if this would WORK but if I had tile glue stuck on the floor I'd try a liberal dose of Goo Gone. The orange scented stuff is available at all our local hardware stores and works like magic on dried glue. Bonus since the glue is on the floor you could apply the goo gone and then let it soak in for awhile! I really like your craft room! The walls are intense but offset prettily by the white floor. Becky-- Thanks for the goo-related advice! And I'm glad someone other than myself likes my color choice. Patrick is iffy. 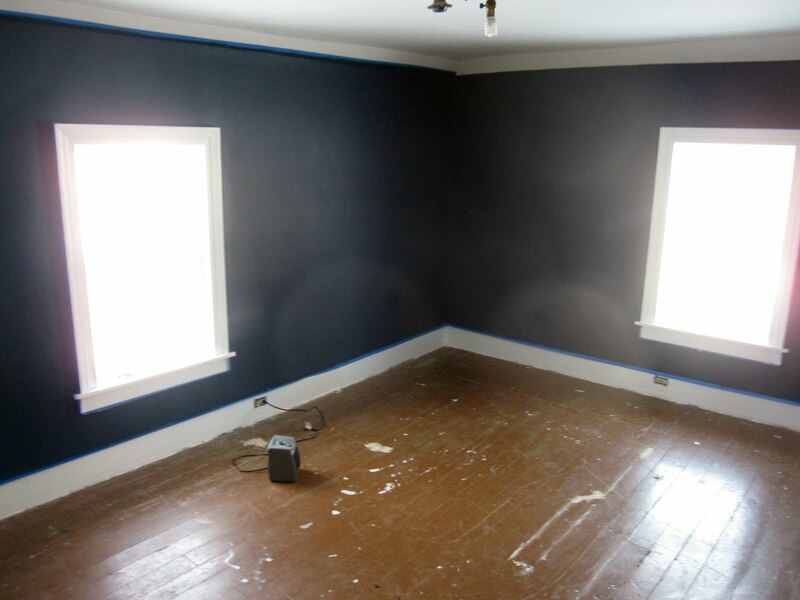 I chose such a dark color with the idea it'd make the trim and floor POP-- which is what it does! 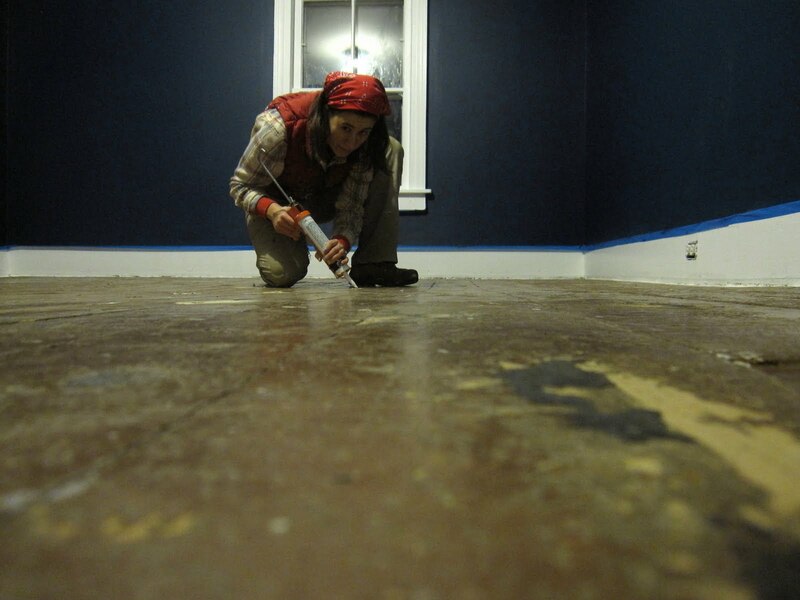 Most types of mastic used to glue down linoleum surrender pretty easily to a heat gun and scraper. I know where you can borrow one, Orrita. Haha, thanks, "anonymous," aka Dad. I think we have a heat gun somewhere, too. Good tip. Kami-- "transformed" might be a bit strong a word, but I appreciate the sentiment! We are planning a very large party in the spring/early summer and inviting everyone we love. YOU ARE ON THE LIST! Y'all really have accomplished so much. I too like the intense color of your workroom. 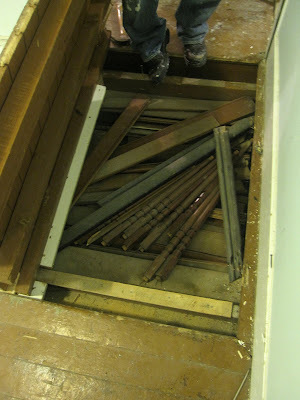 Did you hear me gasp as I read about the trap door! That is soooooooo cool.